The ‘L’ FIN TUBE , ‘LL’ FIN TUBE , ‘KLM’ FIN TUBE also known as Wrap Around Fin Tube . This type of Fin Tube widely finds acceptance where the Heat Transfer Temperature is relatively lower and the cost needs to be controlled. These type of Fin Tube s are relatively lesser in cost as compared to the ‘G’Type Fin Tube and the Extruded Type Fin Tube . In ‘L’ Type Fin Tube or also known as ‘L’ Foot Fin Tube the finning is done by wrapping around the Fin stock spirally around the base tube . This is as reason also known as spirally wound Fin Tube . The base of the fin stock is Shaped in to and ‘L’ shape which gives a base for the fin to stand on firmly. Also the ‘L’ shape provides a certain protection against the atmospheric corrosion. The next version of wrap around Fin Tube and also of ‘L’ Fin Tube is ‘LL’ Fin Tube . The process is similar to the L Fin Tube type . However , the improvement is that the ‘L’ Foot of the previous fin is completely overlaaped by the ‘L’Foot of the next fin. This gives the Fin base a shape of tow ‘L’ foot simultaneously. It provides excellent corrosion resistance. The last and the most widely used type of wrap around Fin Tube is ‘KLM’ Fin Tube or ‘Knurled L’ Foot Fin Tube . This is currently one of the most widely type used and preferred Fin Tube s. This type of Fin Tube is manufactured simillar to the ‘L’ Fin Tube . However, the process involves Knurling the Tube and at the same time the ‘L’ base of the fin stock to firm a frim bond and much better contact between the Fin and the Tube. 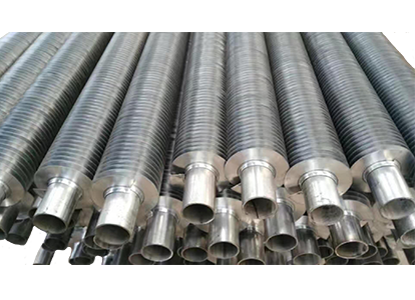 In all the above type of wrap around Fin Tube s the fins are held by Spiral Tension , The ends are required to be firmly held to gather by means of Mechanical Bonding , Brazing etc. This tube also has an added benefit of using Much Lower Thickness of the Base tube thereby reducing the cost considerably. The Extruded Fin Tube s can be supplied with EN 10204 EN 3.1 and EN 3.2 certifications. We can provide Third Party Inspection from any reputed inspection agency.